You asked for it and here it is! 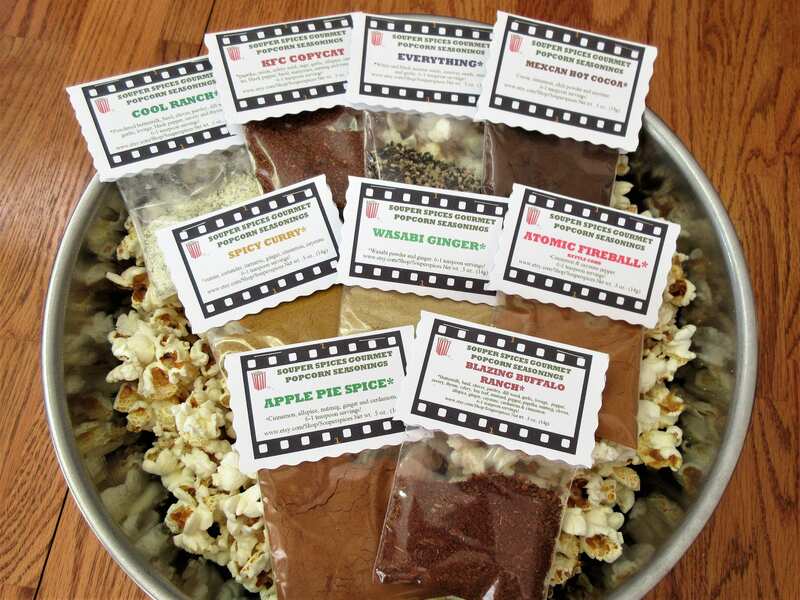 Individual popcorn seasoning mixes for your microwave popcorn! Just melt your butter, add your favorite Souper Spice Mix and salt (or not)! Great to keep in your pantry, for Christmas stocking and perfect for the college dorm! Each packet contains .5 oz (6 full teaspoons) of fantastic flavors for every popcorn lover. 8 NEW FLAVORS (coming soon)!! Keep watching for more flavors to come or suggest your own! Now, I want to share with you some of my tasty ideas and I must admit, I am having a really fun time trying these with family and friends or just for my husband and me. Somehow eating popcorn and watching a movie at home is so much more comfortable and surely cheaper! Enjoy! NOTE: My recipes are only a serving suggestion. We all have different tastes when it comes to salt, butter and sugar (I do not add these ingredients to my blends) so I suggest you start with a little and add more if needed.....butter has always been my downfall! Recipe: Melt 1-4 TB of butter: Add 1- 3 teaspoons of spice blend and sugar. Salt to taste and toss. Try adding salted peanuts! KFC Copycat Popcorn -Paprika, onion, celery seed, sage, garlic, allspice, oregano, black pepper, basil, marjoram, nutmeg, tomato. Recipe: Melt 1- 4 TB of butter: Add 1- 3 teaspoons of spice blend, salt to taste and toss. Try adding Pepperidge Farms Gold Fish! Cool Ranch Popcorn-Powdered buttermilk, basil, chives, parsley, dill weed, garlic, lovage, pepper, savory, thyme. Recipe: Melt 1-4 TB of butter: Add 1- 3 teaspoons of spice blend. Salt to taste and toss. Try adding bacon! Everything Popcorn-White & black sesame seeds, caraway, onion, garlic. Recipe: Melt 1-4 TB of butter: Add 1- 3 teaspoons of spice blend. Salt to taste and toss. Try adding croutons! Jamaican Jerk Popcorn-Allspice, nutmeg, ginger, cayenne, pepper, red pepper flakes, ground thyme, cinnamon, paprika. Recipe: Melt 1-4 TB of butter: Add 1- 3 teaspoons of spice blend. Salt to taste and toss. Try adding 1 C toasted coconut and 2 tsp grated lime or Lime Tostitos! Cajun Popcorn-Garlic, oregano, paprika, black & white pepper, red pepper flakes, onion, thyme. Recipe: Melt 1-4 TB of butter: Add 1- 3 teaspoons of spice blend. Salt to taste and toss. Try adding Spicy Cajun Toasted Corn! Carolina BBQ Popcorn-Cumin, chili powder, paprika, garlic. Recipe: Melt 1-4 TB of butter: Add 1- 3 teaspoons of spice blend. Salt to taste and toss. Try adding crushed BBQ potato chips & a pinch of cayenne! Wasabi Ginger Popcorn-Wasabi & Ginger. Recipe: Melt 1-4 TB of butter: Add 1- 3 teaspoons of spice blend. Salt to taste and toss. Try adding Wasabi Peas! Spicy Curry Popcorn-Turmeric, Coriander, Fenugreek, Cumin, Black Pepper, Ginger, Mustard, Fennel, Allspice, Red Pepper. Recipe: Melt 1-4 TB of butter: Add 1- 3 teaspoons of spice blend and brown sugar. Salt to taste and toss. Try adding sesame sticks! Blazing Buffalo Ranch Popcorn-Buttermilk, basil, chives, parsley, dill weed, garlic, lovage, black pepper, savory and thyme, celery, bay leaf, powdered mustard, pepper, paprika, nutmeg, cloves, allspice, ginger, cayenne, cardamom & cinnamon. Recipe: Melt 1-4 TB of butter: Add 1- 3 teaspoons of spice blend. Salt to taste and toss. Try adding crushed Funyuns! Seafood Boil (Old Bay) Popcorn-Allspice, ginger, bay leaves, celery seed, paprika, dry mustard, black, white & cayenne pepper, nutmeg, cloves, paprika. Recipe: Melt 1-4 TB of butter: Add 1- 3 teaspoons of spice blend. Salt to taste and toss. Try adding prawn chips or oyster crackers! Chili Popcorn- Chili peppers, cumin, oregano, garlic. Recipe: Melt 1-4 TB of butter: Add 1- 3 teaspoons of spice blend. Salt to taste and toss. Try adding crushed tortilla chips! Pizza Popcorn-Onion, garlic, oregano, anise Seed, rosemary, bell pepper, basil. Recipe: Melt 1-4 TB of butter: Add 1- 3 teaspoons of spice blend. Salt to taste and toss. Try adding chopped pepperoni! Dill Pickle Popcorn-Coriander, mustard seed, garlic, onion granules, dill seed, citric acid and dry dill. Recipe: Melt 1-4 TB of butter: Add 1- 3 teaspoons of spice blend. Salt to taste and toss. Try adding crushed potato chips! Herbes de Provence Popcorn-Rosemary, thyme, savory, fennel seeds, basil, lavender, marjoram. Recipe: Melt 1-4 TB of butter: Add 1- 3 teaspoons of spice blend. Salt to taste and toss. Try adding crumbly bleu cheese with with the butter and spices! Franks Red Hot Sauce Copycat: Cayenne, garlic, vinegar. Sweet 'N Spicy Popcorn- Cinnamon, ginger, cumin, cayenne. Recipe: Melt 1-4 TB of butter: Add 1- 3 teaspoons of spice blend. Add confectioners' sugar to taste. Try adding chopped pecans! Recipe: Melt 1-4 TB of butter: Add 1- 3 teaspoons of spice blend and sugar. Salt to taste and toss. Try adding crushed Oreo's or mini marshmallows! Recipe: Melt 1-4 TB of butter: Add 1- 3 teaspoons of spice blend. Salt to taste and toss. Try adding broken pretzels! Recipe: Melt 1-4 TB of butter: Add 1- 3 teaspoons of spice blend and sugar. Salt to taste and toss. Try adding dehydrated apple slices!